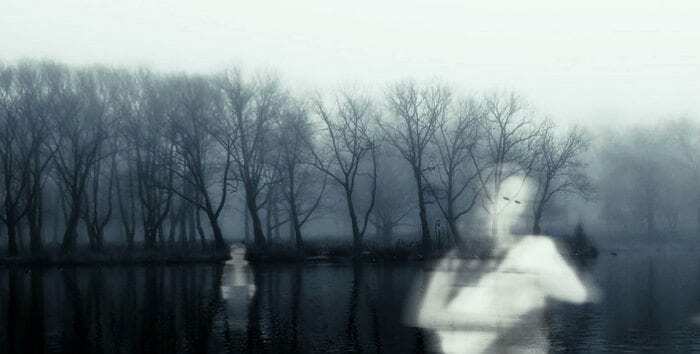 How Did the Ghost Legend of La Llorona Start? The legendary ghost, La Llorona, also known as ‘the Wailing Woman’, is infamous throughout the Hispanic culture. She’s the ultimate iconic Spanish ghost. The tale begins several hundred years ago when a woman named Maria, was born of peasant stock in Mexico. As she grew older, she possessed a rare beauty and was uncharacteristically tall for the time. Marrying young, she bore two children. However, her husband left her for another woman. She consoled herself by dancing the nights away at the cantinas. Wearing a striking white dress, she attracted the notice of many rich men. Maria lived for this attention. In fact, so enamored with her exciting lifestyle, she neglected her two young boys by leaving them alone night after night. One evening, word came to her that her sons had drowned in the nearby river. Whispers that Maria drowned the two little boys herself circulated. The boys served as an obstacle to her marrying a rich man. However, no one knows for sure. Did she kill her children by her own hand, or through neglect? Regardless of the true facts, the future Llorona suffers terrible guilt and remorse. Overcome by terrible grief, Maria searches the river banks night and day for her two lost sons wearing the same white dress she wore to the cantinas. Up and down the river banks she relentlessly searches crying and wailing. Eating nothing, she soon changed from the beautiful woman everyone knew, to having a skeletal appearance. No one could believe Maria’s fine-looking dress torn and in tatters, her hair matted and wild. Eventually, she commits suicide by drowning herself in the river that took her sons. Not long after, the legend of La Llorona was born. People began hearing weeping and wailing and, sometimes load moaning in the dead of night. The spine-tingling cries would come closer and then fade into the distance. This would occur over and over. Along with the frightful wailing, sightings of a tall woman in white at dusk on the banks of the river began to surface. Other sightings claimed a white figure of a woman would float across the river and then disappear into the trees. The sightings of the ghostly figure rapidly became a nightmare for the locals. Highly superstitious, people didn’t leave their homes at night due to fear set in of seeing the apparition and what it might do. Over time, La Llorona’s ghost appears throughout Mexico and the Southwest of the United States. Did Migrant Workers Experience La Llorona? In the spring of 1954, a young woman named, JoAnn, was traveling from Las Vegas to Pueblo, Colorado, with her husband, brother-in-law, and cousin. They were heading north to find work in the fields and orchards. As migratory workers, her family traveled from place to place where work could be found. Small dwellings are provided for the workers and often shared with other families. JoAnn shudders when she recalls one very eventful night in such a place. Just after midnight, her group heard a loud moaning noise coming from the nearby river. The sound was slowly coming closer and closer. Frightened, the families came pouring out of their hovels wondering what the noise could be. Terrified, they huddled together. Finally, braver men got into their cars and trucks to investigate. The men used headlights of cars and large flashlights to investigate the river and pinpoint where the awful moaning was coming from. Just when they closed in on the moaning, the wailing moved to the opposite side of the river. Back across the river the little caravan went, following the wailing sound and then, as before, the sound switched again to the other side. This went on about four times until they finally decided to give up. Just then, the moaning ceased as suddenly as it had begun, and all was eerily quiet. When the men got back, everyone begins talking at once. La Llorona was there. But the nightmare wasn’t over. At a nearby cemetery, a strange noise began that sounded like millions of bees buzzing. The sound reached deafening pitch and then it too stopped suddenly. In the early 1930s on a late sultry afternoon in Santa Fe, New Mexico, patriarch Patricio Lujan sat with his family on the shaded veranda of his home. With his family gathered around, everyone was talking and laughing about the events of the day. All became quiet, however, when they noticed a strange looking woman not far from the house. She was very tall and thin and dressed in white. Fascinated, the group watched as she seemed to glide by and then crossed a nearby ravine onto a road. They did not recognize her from the area but there was definitely something strange about this figure. The group continued to watched as she got to a place where she had to cross the river and then something unbelievable happened. The figure seemed to float over the water then up a hill. “She just seemed to glide as if having no legs.” Patricio recalled later. When the woman reached the top of the hill she suddenly disappeared. Then, she reappeared at a distance of about 500 yards and then disappeared again for the last time. Stunned by what they had witnessed, Patricio and his family rushed out to where she had traversed so close to the house but found no footprints. They realized then, they must have seen the frightening specter of La Llorona. Sworn to by family members to this day, another sighting of La Llorona involved a young impetuous man by the name of Epifanio Garcia. Epifanio was a rebellious son and often at odds with his parents. After one especially heated argument, Epifanio, accompanied by his brothers Carlos and Augustine, decided they would leave their ranch at Ojo de La Vaca and travel towards the Villa Real de Santa Fe. Traveling in a farm cart, the two oldest, Epifanio and Carlos were sitting in front with Augustine in the back. Turning onto the old Santa Fe Trail at Apache Ridge, the brothers in the front jumped when they realized a strange thin woman was sitting between them. It seemed she appeared out of nowhere. They later recounted the ghostly woman was wearing a black gossamer veil and silver earrings. The two boys remarked it was if they felt her presence rather than seeing her clearly as a solid figure. The terrified boys continued on and the woman kept staring straight ahead and not moving. Epifanio wanted to stop the horses but feared something terrible would happen if he did. Finally, the three young men, each in turn, talked with the phantom but all attempts were met with dismal silence. Finally, after what seemed an eternity and nearing the town, the woman looked at Epifanio and said, “I will visit with you again when you argue with your mother”. And with that, she was gone. This frightening story of La Llorona is passed down through the family line word for word from Epifanio’s own account of the ghastly visitor. Nothing was exaggerated. It’s told and retold exactly as it had happened. One has to wonder, though, if Epifanio ever argued with his mother again! A descendent of the Garcia family, Edward Garcia Kraul, has spent much of his time delving deeply into the Legend of La Llorona. He now lives in the very house where the Lujan family (see above) lived when they witnessed La Llorona decades earlier. Edward hasn’t seen La Llorona but hopes someday he will. The legend of La Llorona is still very much alive and firmly entrenched in the Hispanic populations of Mexico and the United States. It’ s believed she is a real spirit that continues to haunt rivers and nearby trees of the western United States and Mexico. She skirts the thick cottonwoods that line river banks, weeping inconsolably. It seems wherever Hispanic people settle, La Llorona follows. Although several variations exist, one version of the story tells of a beautiful woman by the name of Maria that kills her children in revenge because her husband left her for a younger women. Ultimately, she drowns herself in a river. Challenged at the gates of Heaven as to the whereabouts of her children, she is not permitted to enter the afterlife until she has found them. Maria is forced to wander the Earth for all eternity, searching in vain for her drowned offspring. Her constant weeping has earned her the name “La Llorona”. She is trapped in between the living world and the spirit world. Parents often use this tale to prevent their children from wandering out at night. In some versions of this legend, La Llorona kidnaps wandering children who resemble her missing children. She’s always asking her murdered children for forgiveness and drowns other children to take their place. But, her children never forgive her so she keeps searching for more lost children.